After losing her beloved husband and daughter and surviving Hitler’s Sobibor death camp, Quaker widow Anja Steinberg dedicates her life to helping others and keeping her son safe. As a member of the resistance, she helps displaced Allied airmen get back to their units in England. The journey is rigorous and filled with danger and there is no time for romance. Then American Peter Trent parachutes into her life. She must face facts ― her heart did not die with her late husband and true love could be hers again. But will a romance hurt Peter’s chance of escape from the Nazis ― and endanger her life as well? Combine a love for WWII fiction, Christian fiction, and stories of courageous people, Simple Faith ticked all the boxes perfectly. What a wonderful story this is! I was engaged immediately with the characters. I could feel my heart rate speed up at the very beginning and just knew this story would really grab me by the heart and not let go. The author has taken drama, suspense, history, and romance and woven them together so expertly that I felt I was living the story. The characters were relatable and had depth. The storyline was not only believable, but gripping. This is a great book for fans of WWII fiction. Anna Schmidt has outdone herself with Simple Faith. In many ways this book had the same qualities of those wonderful old WWII classic movies, kind of like Casablanca without the questionable morals and dubious ending. Excellent, enjoyable story, and I am definitely looking forward to book 3 when it comes out. ~ Tell Tale Book Reviews gives Simple Faith by Anna Schmidt a 4.5 Bark rating. The writing and feel of Simple Faith are just that — simple — yet the book draws the reader in with every subsequent chapter. This reviewer was torn between who to root for just as Anja was torn between who to love. The story ends in an unexpected way because of all the tragedy and obstacles everyone faces on their way to freedom. Readers will hate to see the story end. Let’s hope Schmidt has more in store for these characters. Anna Schmidt has outdone herself with Simple Faith, the second novel in her series, ‘The Peacekeepers’! It can be read as a stand-alone book without having read the first book, All God’s Children. Until now I was most familiar with her excellent ‘Celery Fields’ series. 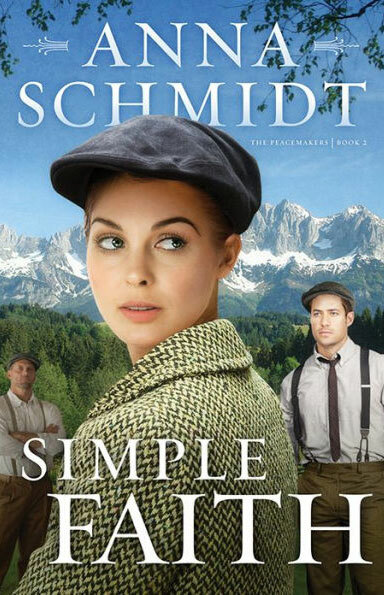 In Simple Faith she demonstrates an incredible eye for research and rich detail in this outstanding story of what ordinary people of faith did as they followed the leading of their Lord through the destruction and terror of Hitler’s rule in 1940’s Europe. This reader was completely drawn into the setting depicted by Anna Schmidt; I felt as if I were part of the action! And I now greatly admire the faith of the Quakers who inspired the characters of Anja, her grandparents and friends and their activities.